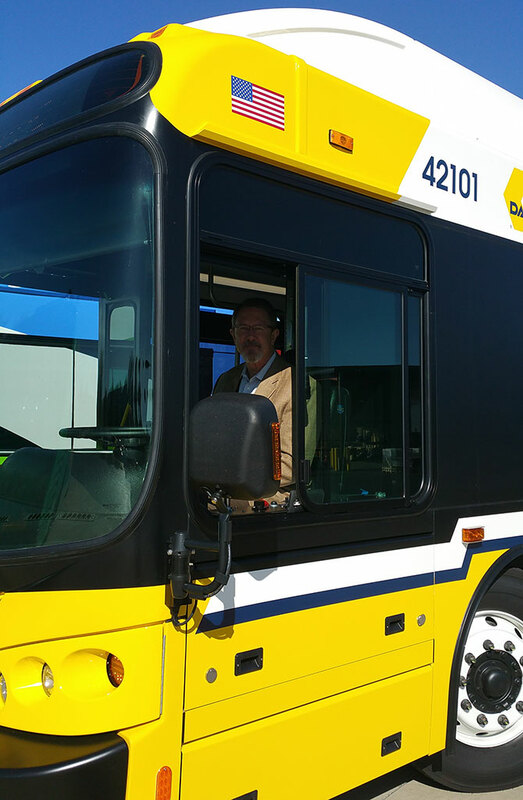 DART President & Executive Director Gary Thomas sits in the last NABI-branded bus. Officials from DART and New Flyer celebrated the end of an era last week with the delivery of the last NABI-branded low-floor transit bus to DART. This bus, which you’ll see on the streets as bus number 42101, is also the final NABI-branded bus to ever be produced. But DART’s newest buses are still coming from the same plant. DART’s bus purchase supports about 600 jobs in the north Alabama city as well as several hundred 2nd tier jobs throughout the U.S. The North American Bus Industries company was acquired by bus manufacturer New Flyer in 2013, two years after DART entered into a long-term contract with NABI to manufacture the current fleet of compressed natural gas buses. DART’s bus order, which remains active until March 2016, included 476 transit low floor buses and 46 suburban express buses. This contract was one of the key components of DART’s plan to rapidly transition to compressed natural gas, saving DART around $10 million per year in bus fuel costs. DART’s 42101 bus rolled off the assembly line last Thursday as the last of the original 476 new bus contract. The order currently includes 46 express buses that will carry the New Flyer brand as their Xcelsior model. Since DART began operation of the NABI buses, nearly 40 million miles have been logged. We say a fond farewell to the 24-year-old NABI brand and we look forward to receiving the 46 New Flyer express buses. So are 42103, 42104, 42105 and 42106 considered “New Flyer LFWs” instead of NABI LFWs? I’m already aware that the 46 express buses will be New Flyer Xcelsiors. The other buses were delivered before 42101. 42101 was the last one produced and delivered to DART.